What a start to the new session! 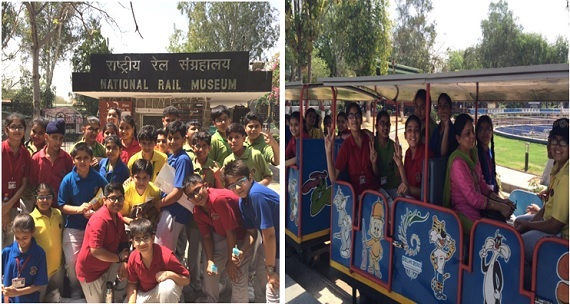 On 8 April 2016, Students of classes VI A,B,C , got an opportunity to explore the two glittering and gleaming gems in our nation’s crown by visiting the National Railway Museum and Indian Air Force Museum. To talk about the National Museum first, our students got to discover the 162 years of Rich Indian Railway’s historic heritage in the in the company of rare steam, diesel and electric locos, royal saloons and lots of artifacts. The experience was further enhanced with an Interactive display to give a clear understanding of how a single investment of Indian Railway helped in unification and progress of India as a nation. The train ride was just an icing on the cake. The next destination for the kids was the ever-so-majestic Indian Air Force Museum. The air itself of the place was such that it invoked the feeling of patriotism in the little patriots. The students were absolutely enchanted by the very best of what the Indian Air Force has stood for in War and Peace. Its compilation is, in itself, a lasting tribute to hundreds of people who have each in their own way contributed to build a glorious tradition. The kids enjoyed every bit of the visit their smiles and enthusiasm was beyond compare.